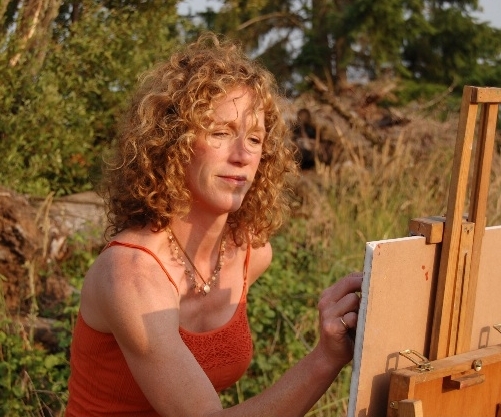 This week we are interviewing Amanda Houston in our continuing series on our gallery artists. We hope that as you get to know the artists, their art pieces will take on an additional dimension for you. A: While I never painted fine art until I was 39, I have a degree in Apparel Design and Textile Design, so drawing isn’t new. I found in those roles in the corporate world I was drawing and creating less and less. It wasn’t until I took a voluntary severance from Nike (my last corporate job) that I started to take a pastel class and an oil painting class. In both classes, I sold pieces to fellow students, which made me wonder if I should not wait till I was 65 to start. So I started a family and started to paint at the same time. Q: What are your favorite mediums to work with? A: While I paint in oil, my love and my first choice of any medium is pastel. It is the perfect combination of drawing and painting at the same time and I love the speed, the forgiveness and the ease of putting it down and picking it back up again a month later that oils don’t give me. While I long to paint in oil more, the majority of my work is still in pastel. Q: What do you want people to get from viewing your work. A: I think most people find my work to be peaceful and calming in an uplifting, motivating way. My pieces tend to capture the stillness with energy and life. A: I don’t have to go far for inspiration. I live amongst farmers in Oregon’s Willamette Valley, amidst rolling hills of vineyards and farmland and near lots of wetlands. I am fortunate that I don’t need to leave my property to find inspiration. As a landscape artist drawn by the beauty that surrounds me, I savor the days when the light seems magical, often at the edges of our day, at sunrise and sunset in the turn of seasons when the fog and mist make an ordinary turn in the road felt mystical. Q: What artists are you inspired by? A: The contemporary artists I am inspired by would have to include many local Oregon artists such as Richard McKinley, Marla Baggetta, Ramona Youngquist. 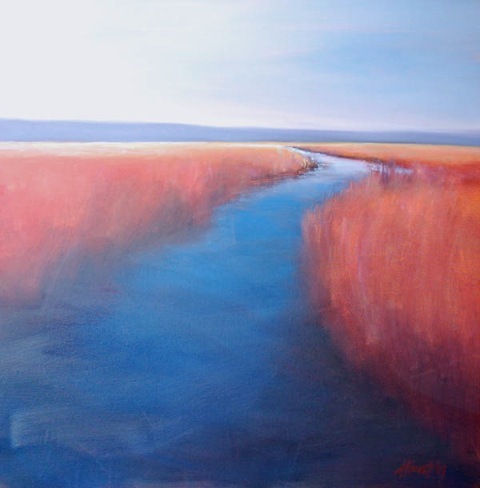 Other contemporary painters that inspire me include Brent Cottonwood, Nancy Bush, Elizabeth Ganji. As for the masters, the French and Californian impressionists are among my favorites. Q: What is a recent work that you have produced? A: I have to say I am onto something with my pastel paintings on copper because I can hardly keep up with the demand. I wanted to innovate in the medium and try pastel on metal and I wanted to create a “sustainable” collection that would meet a new price point need in the recession. They are fresh and contemporary in the way I frame them, I recycle the copper from metal yard scraps and most retail for under $400. 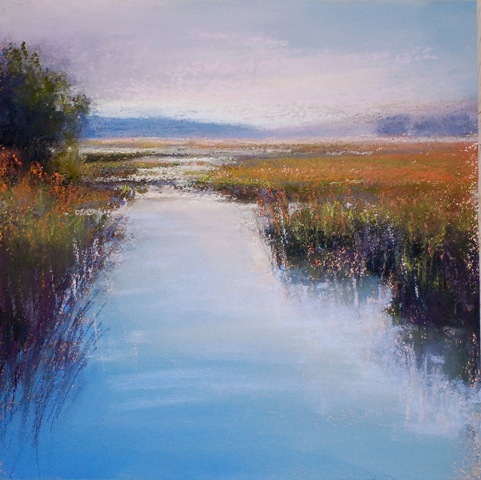 I also enjoyed painting the large bright wetland in oil. Q: What else do you do besides create art? A: I find art comes into my life in waves and stages. When I’m prepping for a show, I put my blinders on and the dishes pile up. And then I get back to “the rest of my life,” which is so full even without the art. My husband and I have been remodeling an old historic hunting lodge on a 30 acre farm just 40 minutes west of Portland amidst farmers and vineyards where we raise grass fed beef and farm fresh eggs with a lovable black lab and two newly acquired black kittens. We also are remodeling a vacation home in the San Juans and for the past 3 years, construction has been the focus of our DIY lifestyle. When I’m not sketching out a new room or designing a new bathroom (we have 7 we are doing!) I love being outside. I’m an avid gardener and from April through November, I have my hands in the dirt either tending and harvesting our vegetable garden our one of my ongoing perennial gardens. I love to cycle (almost as much a painting) and am fortunate to go out my back door to world class rolling hills or endless countryside. As an old competitive triathlete, I will always make time daily to get some exercise, either on the saddle, in the pool or at a yoga studio. I love to cook and entertain but what comes before anything else is my growing family that keeps me busy with sports, music or lego-roboitcs and lots of after school volunteer activities. I’m also on the board at a local gallery trying to make a difference. I help my husband market our commercial and residential development business in Portland and do some business consulting on the side. Needless to say, we wouldn’t watch TV even if we had cable. Q: How do you think Cole Gallery differs from other galleries? A: Denise is what every artist wants in a gallery director: someone who goes the extra mile to plan, market, and sell our art. Someone who doesn’t just have a monthly show, but pulls out all the stops to have a monthly “event” with catered food, live music and a raffle. She’s classy but not pretentious. She advertises in local and national media and is savvy with all her online marketing. Most of all, she’s present, involved with all her artists, is a wonderful communicator. It has been an honor to be represented by her. You can view more of Amanda Houston’s work on Cole Gallery’s website.